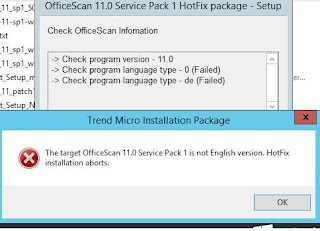 Reader "seno" commented, that TrendMicro sends out a patch on request. After a few minutes with TrendMicro's support, they sent me a download link for the patch. The patch goes by the name: "osce_11_sp1_win_en_hfb6178.exe". I should have guessed that from the "_en_" in the file name. So I went back to TrendMicro's OfficeScan support and complained. They told me that their developers were working on a German version of the hotfix and that they'd let me know when it is available. If you have an English installation, you should be fine with this patch. Got a German patch now, too. Works fine.